The phrase “love handles” is a slang term commonly used to refer to the region of the abdomen/hip that protrudes over the sides (not front) of your pants, visible from both direct front and direct rear view. This is one of the most common areas of complaint in males, although some females also have problems in this region. This area is also referred to by some as the “hips”. Even in patients who actively diet and exercise (and are in the “normal” range according to BMI charts), love handle/hip fat bulge is a common area of complaint. This area frequently leads to frustration since it seems not to get any better even after strict diet and exercise. 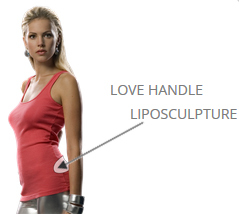 HOW DO I KNOW IF I AM A GOOD CANDIDATE FOR LOVE HANDLE LIPOSCULPTURE? Look at yourself straight on in a mirror while wearing pants but no shirt. 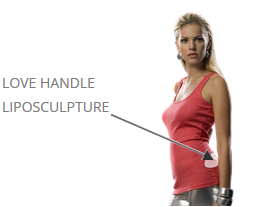 If you notice a bulge of fatty tissue overhanging the outer sides of your pants – then you may be a good candidate for love handle/hip liposculpture. If someone takes a straight on photo of your back in the same outfit, you would also see this bulge of fatty tissue overhanging the sides of your pants. Again, this zone is seen on straight on views both from the front and back. (It is important not to confuse this area with the lower back region or the lower front of your abdomen). 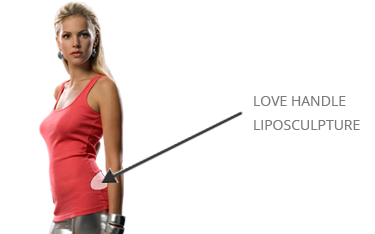 If you do not have excess hanging skin in the love handle/hip area, then you may be a good candidate for liposculpture of the love handles/hips. Abdominoplasty (tummy tuck) patients who are in the overweight or obese range according to BMI charts, frequently have persistant excess fatty tissue in the love handle location – even after an abdominolpasty. Significant cosmetic benefit can be gained by undergoing liposculpture in this region either after or at the same time as an abdominoplasty. Since the love handle region is such a small focused area – recovery is generally quite rapid. Dr. Hayduke prefers to perform this procedure under local tumescent anesthesia – with the patient fully awake and comfortable in the office setting. The actual suctioning of the love handles generally takes less than one hour. An elastic compressive binder is worn over the treated area for one week. Patents can return to a desk job in about 48 hours.